What makes the multi-denomination Dragon Shrine slot game unusual and very unique is that during the base game you play it in the usual fashion, that being by you being able to form a winning combination from left to right in the standard way! However, as soon as you have triggered its main bonus feature you instantly get double the chance of forming multiple winning combinations as the playing structure and format changes into a Both Ways paying slot, so winning combinations can be formed from left to right and additionally from right to left too! The design of the QuickSpin designed Dragons Shrine is slightly different to most other slots for this one has five video reels however reels one and five have three in view reel positions and the middle three reels have four in view reel positions. However spread over those five video reels are 40 pay lines, and this slot is one on which it will only cost you 20 coins to have that playing structure in play. As such a minimum stake spin will cost you just 0.20 as the paylines are fixed and the maximum stake per spin has been set at 80.00 so it is a slot that will suit every player’s bankroll! There is something known as a Dragon Stack Re-Spin feature waiting to be triggered on the Dragon Shine slot, that bonus feature is awarded via the base game and to trigger it what you will need to get spinning in are the Dragon symbols on the first reel in such a way they cover the entire in view reel positions on that one reel. You will then see the slot playing off 3 Re-Spins however as they all play off any the Dagon symbols on reel one are locked into positions and any Dragon and/or Wild symbols that spin in also get locked into position too for the remaining Re-Spins. Not only can you trigger the above feature whenever you set about playing the Dragon Shrine slot but you could also trigger a second feature, that being a set of free spins. It is on reels two, three and four that you will see spinning in green coloured House scatter symbols, and to be awarded with a set of 10 free spins each of those scatter symbols have to spin in on their respective reel at the same time in the same spin. During the free spins bonus game all winning payouts are formed Both Ways, so you get double the chances of winning when it has been triggered. The Dragon Stack Re-Spin feature can also be triggered when you are playing off your free spins, but when the stacked set of symbols spin in on reels one or five they will be transposed onto the other reel too. Due to the sheer number of ways to win that you are going to have in live play one each spin you play off you will of course want to see as many of the wild symbols spinning in as possible, as they can often help increase the number of winning ways you have achieved. The Wild symbols are also the highest paying reel symbols on this slot and the only symbols that can be spun in that the wild symbols do not stand in for are the bonus scatter symbols, but they will stand in and help you form any other reel symbols winning combination! 3 Wild symbols in a line pay 40 coins. 120 coins are paid when 5 Dragon symbols line up. 40 coins are paid when 4 Dragon symbols line up. 20 coins are paid when 3 Dragon symbols line up. 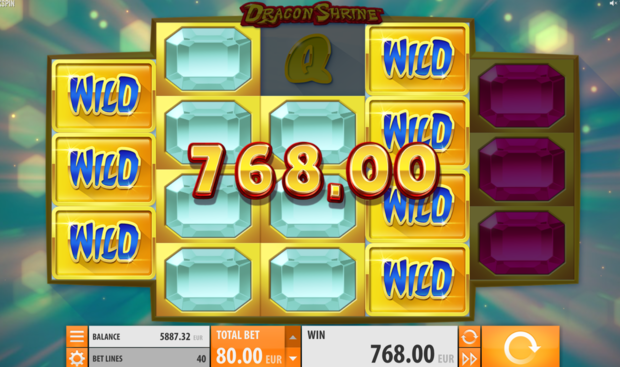 We enjoyed playing the Dragon Shrine slot game for we love the fact that when the free spins bonus game has been triggered you have twice the number of ways to spin in a winning combination thanks to the Both Ways playing structure. Plus, as the Re-Spin feature can additionally be triggered during the free spins bonus game that is where the high volatility of this slot game really does come into play, and where you could win some very sizeable bonus game winning payouts. Being a slot from QuickSpin that does boast a high payout percentage and being a multi-denomination slot too this is a slot we are happy to recommend to any slot players out there who do like action packed and very exciting video slot games to play, so make sure you do set about playing it soon!